Jan. 15, 2015 12:00 p.m. In February the Leduc Library will open its doors in a brand new facility designed to meet the needs for patrons in the 21st Century. The library has come a long way from the days in the late 1890’s when a schoolteacher used a lawyer’s office to establish Leduc’s first library. Karl Martin arrived in Leduc from Illinois in the late 1890’s to buy a farm, but soon found out that farming was much harder than he anticipated. As a 32 year old, Martin was up for adventure, he soon partnered with 17-year-old Johnny Pyrcz to open a farm implement business, which eventually transformed into a hardware store. In 1900 Martin married Leduc’s schoolteacher Miss Anson. Karl would become the chairman of the trustee board for the Leduc urban school district in 1903. As a former teacher, Karl had acquired a number of books and saw a need to share these with the general public. By 1912 he had arranged for J. Mundy, a lawyer, to donate space for people to exchange books and thus Leduc’s first library was born. That same year Karl Martin bought out his partner Johnny Pyrcz and would run the hardware store and act as Leduc’s first librarian for the next three years. In 1913 Martin was elected to town council but Karl decided to return to teaching in 1915 and acquired a position in southern Alberta. He sold his hardware store and was gone by the end of the summer. Without a librarian, Leduc’s first library came to an end and it would not be until 1947 that its doors would reopen. In the fall of 1946 the Women’s Institute passed a motion to establish a library. By January of 1947 they had arranged to rent a house on Main Street for $5.00 a month, had acquired 24 books for a grand total of $2.50, and an additional 300 books for $15.00 from the President of the Vegreville Women’s Institute. Thanks to the Leduc Lions Club the books were able to sit on shelves made and donated by the Club. Within five months the library was on the move as it relocated into the Meadowbrook Hall where it remained for the next four years. In 1951 the Institute decided to purchase an old Edmonton streetcar for $150 dollars and painted it up and added nearly a thousand books. The streetcar was placed on the corner of 47th Avenue and 48th Street. Kathleen Henderson was appointed as the librarian. The Women’s Institute worked hard to make the streetcar presentable by painting and placing curtains throughout but by 1955 many of the town councilors were of the opinion that the streetcar had become an, “eyesore” and led by then Mayor Fred Johns offered the Women’s Institute space in the new town hall for the library. After 15 years of operation by the Women’s Institute, the library was donated to the Town of Leduc in 1962 and the library became part of Leduc’s everyday operations. This was by no means the end of the library searching to find a permanent home. Within a year of taking over the operation of the library Leduc officials came to the realization that it had outgrown the southwest corner of the town hall and in 1963 it was temporarily moved to the newly constructed fire hall. For the next eight years it was the home of the library, but as the library continued to grow, both in the size of its collection and the number of members taking advantage of its services the library outgrew the facility. In 1973 the library had returned to the Town Hall. As Leduc matured as a City, both the City Hall and the Library continued to grow. In 1983 the City began plans for a new facility in Alexander Park and by 1986 the library had a brand new home. Most believed that the new library would meet the needs of the community for many decades. Neither the city nor the library could have foreseen the rapid growth of Leduc. Libraries have always needed interested people to assist it in providing services to the public. In the beginning it was one man, Karl Martin, that had the knowledge and will to establish a library in Leduc. Then it was the Women’s Institute that got the ball rolling in the 1940’s. In 1984 the Friends of the Library (FOTL) was formed and since that time they have come forward time and again to aid the Leduc Library in its development. In its very first year it was able to convince the city to make the library 12,000 sq. feet rather than the original proposal of 9,000 sq. feet by raising over $210,000 to pay for the additional space. It became obvious early in the 21st Century that both the city and the library were in need of expanding. Decisions were made to build a new library at the Alexander Park location, which would allow the library to expand to 18,000 sq. feet from the current 12,000 and allow the library to provide its patrons with the environment and technology that a modern day library offers to its members. When the library expands into its new location, the city will be able to transfer the old library site into much needed office space for city officials which will allow citizens to come to one location to do all of their business with the city. On February 2nd, the Leduc Library will begin a new chapter in bringing library services to the citizens of Leduc. One should expect that this home would be permanent and that future changes will be in the form of satellite libraries. 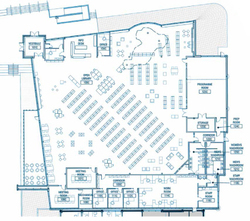 Pictured: Architectural drawing of the new library .February will see the opening of Leduc’s new Public Library, the culmination of many people’s efforts over many years to provide a continued opportunity in Leduc for learning and enjoyment. Photo Tom Dirsa. See more photos in this week’s paper.